The most unique feature here at SMART-POPCORN.com is our Review System. Most critics quantify their reviews using grade letters, four-star or five-star rankings, or most iconically, the "thumbs up" and "thumbs down". Ours is a completely different approach. First and foremost, instead of rating movies on a single scale, we rate them on two: "Smarts" (Artistic & Technical Merit) and "Popcorn" (Entertainment Value). The reason is perhaps too obvious--some very well-made films are not necessarily considered conventionally enjoyable or possessing of mainstream appeal; and there are many, many poorly fleshed out and fundamentally flawed films that are still capable of eliciting some laughs, thrills, and chills. Often the amount of effort spent making a film is directly proportional to the quality of the results, but not always, and by considering these factors as two separate, unrelated "dimensions", one can quite literally construct a shape and an image--say, a graph--of the film's properties. In this simple case, the "Dull Seed" film is both far less professionally/artistically made and far less entertaining than the "Smart Popcorn". However, it is not always such a black and white scenario. Here we have a "Wry Cobb", a well-made film that's perhaps somewhat of a bore to the average moviegoer, compared to a "Candy Corn", a dumb-but-fun popcorn flick. Which one's better? Eureka! Some audiences would most certainly prefer the former, but others would just as vehemently choose the latter. SMART-POPCORN.com believes the choice is yours to make, so we simply provide you with the information you need to decide. But the most important reason for 100-point scales is, simply put, freedom of choice. Critics at SMART-POPCORN.com are no longer limited to ambiguous four-star, five-star, thumbs-up or thumbs-down scores. Even the more decisive grade-letter scale is rendered obsolete. Our critics have the freedom to think, to decide whether a film deserves an 80% or an 85%, a 98% or a 99%. It adds to the challenge of rating each film, certainly, but we believe the extra effort provides our readers with all the more precision and information to draw from. Of course, since very few other critics use a two-scale system, it's still difficult to compare SMART-POPCORN.com scores to the traditional approaches. Because our scores are not simply bad or good, we've established particular ranges to be represented by mascots. 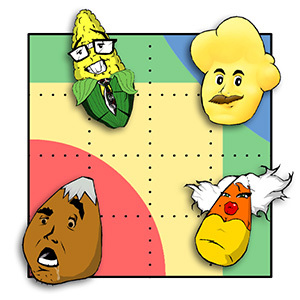 As you might guess, these are the aforementioned "Dull Seed", "Wry Cobb", "Candy Corn", and "Smart Popcorn". Dr. Polonius J. Popcornius, a.k.a. Professor Popcorn, has spent his entire professional career seeking the elusive Unifying Formula for Great Movies. At last, he found it: a Great Movie must be well-written, well-made, and well-acted, and must involve a subject matter that is compelling, entertaining, or emotionally resonant to the audience. He now champions such Great Movies, which are now appropriately and collectively referred to as "Smart Popcorn". Films with Combined Ratings of 75% or greater are awarded Smart Popcorn status. Wilbur Ryan Cobblepot has never been the coolest kid in the room, but he's almost always the smartest. Ryan is a socially inept grad student studying under the legendary Professor Popcorn, researching his thesis: the method and rate at which arthouse and experimental films advance the greater film community and pave the way for mainstream successors. Films with Smart Ratings of 80% or greater are classified as Wry Cobb films. Candice Cornford, college sorority girl, has pledged herself to a cause, as well: to live it up, have as much fun as possible, throw caution to the wind... and throw artistic and intellectual pursuits out the window. Some say she's immature. Some say she needs to wake up and smell the real world. They may be right, or they might simply be jealous... After all, she knows how to have fun. Films with Popcorn Ratings of 80% or greater are classified as Candy Corn films. H.K. Dulles mops the floors at Smart Popcorn University, but this janitor is no Good Will Hunting. If ever he had grand aspirations, he never expressed them nor pursued them. He seems content to wander the halls, day in, day out, cleaning up the failed experiments of film studies. Films with substandard scores in both Smart and Popcorn scales are admonished as Dull Seeds. Not satisfied? Stay tuned for our advanced guide, More Fun with Numbers!